Executives responsible for human factors and usability testing play an integral role during the product’s design and postmarket operations in order to ensure medical devices are intuitive for HCP and patient use. Human factors teams are able to maintain a product’s seamless usability through comprehensive safety validation strategies and by also working with end-users in the products’ intended environment. As regulatory expectations for new and legacy products continually become more stringent, understanding how to quickly and cost-effectively conduct usability testing that not only validates products but provides deep insights into the true function of the product has never been more essential. HF engineering is a critical component to identifying and remediating potential user errors associated with devices, ensure regulatory compliance through the completion of summative studies, and create human-centered device designs that meet the needs of the end-user. Building on conference knowledge share and successes of past years, the 2018 program will showcase industry experts in human factors and usability testing, who as presenters will share experiences and knowledge that will be of great benefit to all attending delegates. 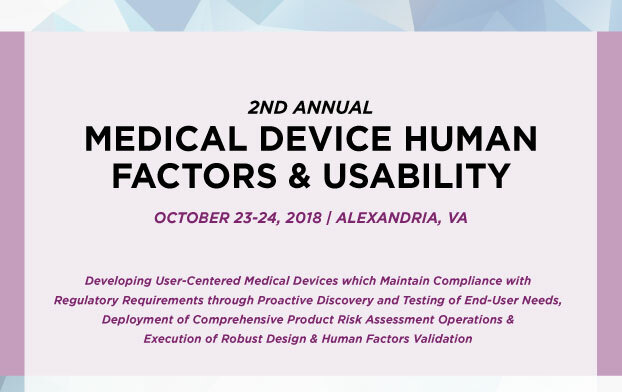 Industry leaders will address a multitude of topics ranging from preparation strategies for FDA dossiers, EU MDR impact on IFU standards, and the utilization of heuristic evaluations. Through case study driven presentations, as well as interactive panel discussions complemented by multiple networking opportunities, the program will foster a sense of collaboration and promises to be a valuable program to those who are looking to streamline and enhance usability operations.